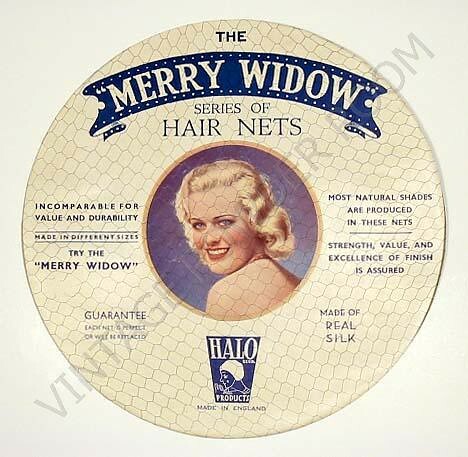 I selected the MERRY WIDOW hairnet package in honor of Jean Harlow’s birthday for a couple of reasons; because it was made in England, I believe it demonstrates the world wide appeal of Jean Harlow – the woman on the package was obviously mimicking Jean’s look. Also, it’s an ideal segue into a reflection on Harlow’s ‘boudoir’ style. 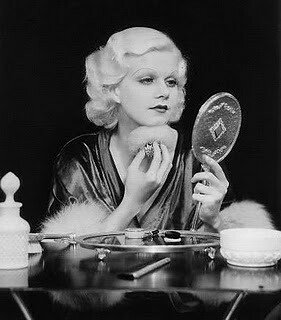 Jean’s now iconic platinum blonde hair was a revelation when she appeared in her first big hit, HELLS ANGELS, in 1930. It was an otherworldly shade of blonde that made her appear as if she’d just stepped out of a cloud, and brought a part of it with her. When she was cast with Loretta Young in PLATINUM BLONDE (1931), Howard Hughes convinced the producers of the film to rename it from the original title of GALLAGHER in order to promote Jean’s image. Hughes’ suggestion was dead on – Jean’s platinum tresses sent women stampeding to their local drugstores for cases of peroxide. And for those women who needed advice on hair tinting, J.W. 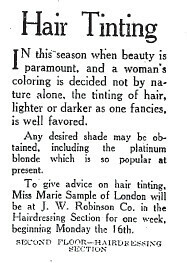 Robinson Co. department store in Los Angeles offered a tutorial with Miss Marie Sample of London. There were even a series of ‘Platinum Blonde’ clubs (organized by Hughes). The clubs offered a prize of $10,000 to any beautician who could match Harlow’s shade. 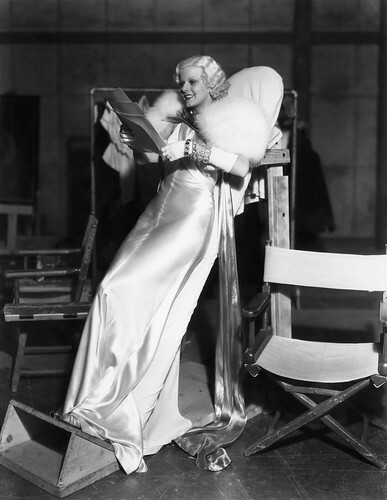 And long before the ‘underwear as outwear’ look became popular (think Madonna in a bustier), Jean Harlow was wearing gowns that would have been as much at home in the bedroom as at a party. For DINNER AT EIGHT, the incomparable designer Adrian created a breathtaking gown for Harlow. The dress of white satin was as fluid as a chilled martini, and it hugged her curves so closely that she couldn’t even sit down in it. Lillian ‘Lil’: [trying on a dress in a store, Lil positions herself in front of a sunny window] Can you see through this? Off-camera store clerk: I’m afraid you can, Miss. Lillian ‘Lil’: I’ll wear it. My favorite of Jean’s films is RED DUST (1932) – and in the scene I love the most, Jean is taking a bath in a barrel of water. She’s effervescent, charming, and seductive all at once. It’s no wonder that Gable couldn’t stay away from her! 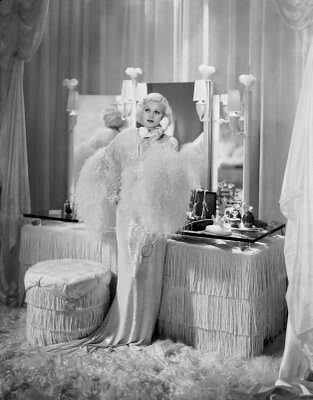 Jean Harlow was a cotton candy confection of a woman, but she never seemed aloof or unapproachable. She often wore a smile, if little else, and her eyes were full of intelligence, warmth, and humor. She will be forever mourned. This Sunday, March 6, 2011, I’ll be attending a celebration of the centenary of Harlow’s birth at the historic Egyptian Theater in Hollywood. The event is being hosted by the Los Angeles Art Deco Society, and co-hosted by American Cinematheque.